Physicochemical Properties: It is a purple red crystal of monoclinic system. It's easy in moisture absorption. Melting point:60℃. It will be decompose at 125.5℃. 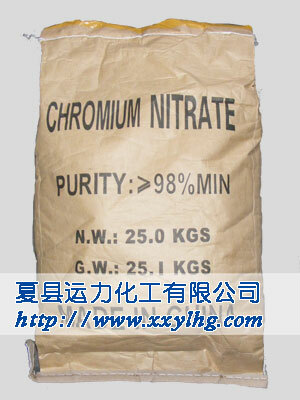 The chromium nitrate monahydrate can be easily dissolved in water, alcohols and acetone, acids. Its aqueous solution is green when heated, turn into reddish-purple rapidly after cooling. It has a property of rot, and it can burn our skin. It will burn once in contact with easy combustion things. 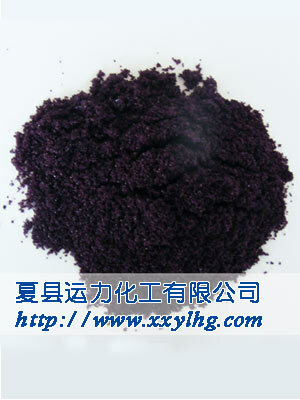 Applications and Usages: The major applications of chromium nitrate include preparation of other inorganic or organic chromium, catalysts and carrier materils, corosion inhibitors and dye mordant as well as colorant in glass industry and colored glzae of ceramics. Packag: 25Kg/bag , plastic inside and knitting bag outside, or in terms of customer's requirements.